Jaybird BlueBuds X vs Plantronics BackBeat FIT Bluetooth headphones – which are better? UPDATE: Prices on Jaybird Bluebuds X are currently slashed because Jaybird has introduced and is madly promoting the Jaybird X2. So at the moment, the price of Jaybird BlueBuds X is so extremely competitive, that you can get Bluebuds X for almost the same price as Plantronics BackBeat FIT – even though they are usually double the price! New! Check out the Best Selling Headphones of 2016! If you want Jaybirds, now is the time to buy. If you do, please repay my work on these posts by clicking through from this post! For a long time, JayBird has dominated the Bluetooth headphones market, but at a price that many people find pretty steep. Plantronics has taken JayBird on, hitting the market with what looks to be a comparable product at a significantly cheaper price. So the question is: do the (usually) much cheaper [easyazon_link identifier=”B00KJLMBQQ” locale=”US” tag=”avejoecyc0e-20″]Plantronics BackBeat FIT[/easyazon_link] Headphones really compete with the JayBird Bluebuds X Headphones? Battery indicator Small icon shows on iPhone to indicate battery level; battery level can be checked at any time by touching tiny button on right headphone - a voice tells you the level Small icon shows on iPhone to indicate battery level - hard to see. A voice tells you battery levels. 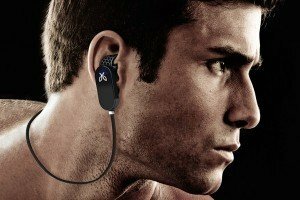 Jaybird BlueBuds X vs Plantronics BackBeat FIT Headphones – Which sports headphones are better? The packaging of the Plantronics BackBeat FIT headphones is high-class. But so is the packaging of the JayBirds. No winner here – they are both good. Of courses, both sets of headphones come with micro USB chargers. No contest there. However, there is a difference when it comes to cases. The Plantronics headphones come with a very good-looking neoprene carry case (in blue and black to match the Bluetooth headphones). This can be used to carry around the headphones, or you can turn it inside out to carry your smart phone on your arm while you exercise. This is a very neat little extra. 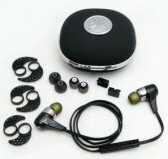 On the other hand, the JayBird Bluebuds X headphones come with a high quality, hard-shell, round container for storing the headphones and accessories. Looks good, but you cannot wear it on your arm. So on this one, I would have to say that Plantronics headphones beat out JayBird. You can see the Plantronics being worn in the video. JayBird claim these are the world’s smallest headphones, at 13.8 grams. It is true that they are very tiny, yet deliver amazing sound. 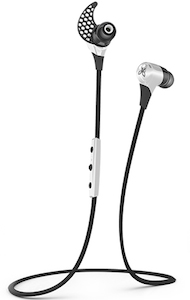 The JayBird BlueBuds X Headphones are definitely lighter than the Plantronics, which weigh 24 grams. So in terms of weight, the JayBird BlueBuds X Headphones are better than the Plantronics headphones. The JayBird BlueBuds X Headphones are designed to block out ambient sound, giving you an immersive sound experience. The Plantronics are designed to NOT block out ambient sounds, so they do NOT give you an immersive sound experience. The reason being that Plantronics expect that you will be wearing their product while cycling or running, and will actually WANT to hear the bus approaching you from behind. By and large, this works for me, because I DO want to hear that bus. In fact, the problems of immersive headphones are so numerous that taxi drivers in London are petitioning for a law that would require pedestrians to take off their headphones before they cross the street! The problems of immersive headphones are so numerous that taxi drivers in London are petitioning for a law that would require pedestrians to take off their headphones before they cross the street! However, on pubic transit, I sometimes find myself wishing that ambient noise could be excluded – especially when that ambient noise consists of loud, incomprehensible public service announcements that drown out my music while giving me no useful information at all. Or when there are loud, incomprehensible crazy people or drunk people on board. At times like that, I sometimes cup my hands over my ears (not really the cool, calm look I am going for – more like the crazy guy look). Although of course, the crazy guy look does has the advantage that the crazy or drunk people don’t harras me. So it comes down to personal choice – if you are not worried about hearing ambient noise because you are never in situations where hearing ambient noise could save your life, go for the Jaybirds. But if you are sometimes or often in situations where you need to be aware of your surroundings, think about the Plantronics. For example, if you are a runner or a cyclist. This is very similar on both sets. Both have non-replaceable lithium batteries, with a very respectable 8 hours of listening time. Charge time is similar, with Jaybird headphones being slightly faster. On the other hand, when the [easyazon_link identifier=”B00KJLMBQQ” locale=”US” tag=”avejoecyc0e-20″]Plantronics Backbeat FIT[/easyazon_link] headphones are done charging, the entire earpiece turns blue. This is easier to see than the tiny green light of the Jaybird headphones that comes on when charging is done. On balance, pretty much a dead tie between the two headsets here. In this aspect, the Plantronics headphones beat the Jaybird headphones hands down. Jaybird headphones come with a lifetime sweat guarantee, but they are not waterproof and cannot be immersed in water. Also, bear in mind that the batteries only last at most two to three years, and cannot be replaced. So that’s a pretty short “lifetime” guarantee. 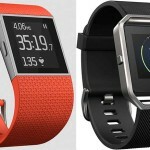 As for the Plantronics BackBeat FIT the manufacturers claim that they can be immersed a meter deep in water for up to 30 minutes. This is awesome, and should mean they are 100% sweat resistant, and also will be just fine if you accidentally step into the shower while wearing them. I have worn these while floating around a pool, and they have been just fine! AS that sports headphones are meant to be worn in rain or shine, I think the waterproof aspect of the Plantronics headphones gives them a distinct advantage over the Jaybirds. This one is tough because it’s subjective. The Plantronics headphones sound a little deeper. I love the sound on both sets of headphones, and can get fully immersed in music or a show while wearing them, with that great sense of surround sound that headphones impart. However, on balance I would have to say that [easyazon_link identifier=”B00B6ZGSVI” locale=”US” tag=”avejoecyc0e-20″]JayBirds X[/easyazon_link] sound is better and more nuanced. And certainly more immersive. On this, the Plantronics BackBeat Fit headphones have a very slight edge over the Jaybirds. JayBird Bluebuds X come with strange little comma-shaped ear cushions that are supposed to hang onto your ear and prevent the headphones falling out of your ears. I found they did not help at all. Plus they can stick out of your ears vertically, making you look like a bat. Of course, you have the option of wearing them without the ear cushions, in which case, they may or may not stay in your ears. They come with small, medium, and large foam ear tips, so one of these may turn out to be a perfect fit for your ears. I know they work perfectly for many people, and about 90% for me. In fact, JayBirds have won awards for their secure fit. 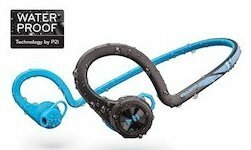 JayBird BlueBuds X Bluetooth Headphones are one of the highest rated headphones in the world for secure fit. Instead of ear cushions, Plantronics headphones have little plastic loops to keep the headphones in your ears. They seem to help, but I think it has more to do with the loop over the top of your ears. This is the main stabilizer, followed by the plastic band at the back of your head, with the little loops helping to pull the whole package together into an awesome, stable fit. These things pretty much never fall out of my ears. So in terms of fit, both are very good, but Plantronics BackBeat FIT headphones are even better. This sounds like an odd one, but I actually find it quite important. Say you are listening to something and then your boss, your buddy or your partner starts talking to you. You need to remove your headphones to hear what they are saying. Then it might turn out to be hours before you want to put them back in again. With the JayBirds, you can just leave them hanging around your neck, inside your shirt. They’re not going anywhere. But with the Plantronics, I think because the band is shorter than the JayBird’s cord, they move around and can fall out of your shirt. So your best bet is to pull them off and stuff them into a pocket. However, if you forget to do this, there is a slight risk of losing them. So on this one, JayBird Bluebuds X wins over Plantronics. 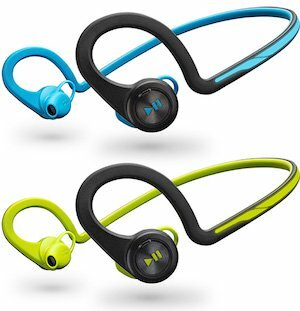 The Plantronics BackBeat FIT Headphones are made to use while running or working out. So they will not fall out of your ears. However, a few users have complained that the rubber cord jumps up and down on their neck. The JayBird Bluebuds X Headphones are not specifically made for sports – but being Bluetooth and having a secure fit, they work pretty well for sports as well. No clear winner on this one. This is purely subjective. When using the headphones to make phone calls, I seem to get fewer complaints that people cannot hear me with the Plantronics headphones than with the JayBirds. However, most other users of JayBird headphones do not seem to have this problem, so it could just be my relatively soft voice. I think this one should be called a tie. Both sets have similar controls: Stop/pause/back up a track/volume/answer or decline call. However, Jaybird headphones also has go forward one track. Both sets have very tiny controls, but I find the JayBird headphones slightly easier to work. Instead of being integrated into the headphones themselves, they are on a tiny little unit near the ears. This is slightly easier to work with than the very tiny controls integrated into the earpiece of the Plantronics. Although once you get used to them, they become quite intuitive and second nature. Jaybird headphones win this one (narrowly) for being slightly easier to use and having one extra function. 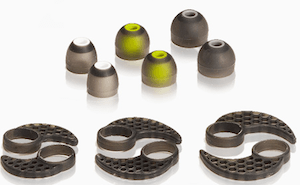 The Plantronics BackBeat Fit headphones do not stick out from your ears much – they have a flat profile, which I like. I don’t need things protruding conspicuously from my ears. Actually, they are quite stylish – I don’t feel embarrassed to be seen in public with these. The Plantronics headphones also have a reflective finish to help you be seen at night. But given their tiny size, I cannot see them as being a major safety feature. 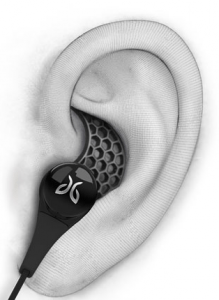 The JayBird headphones definitely protrude a bit more. So on balance, I think the Plantronics headphones look better. However, this is a very subjective measure – you might prefer the look of the JayBirds. I call this one a tie because it’s too subjective to rate. 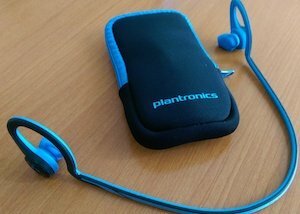 Plantronics are available in blue and green (or is that yellow)? Plantronics are available in green or blue; JayBird BlueBuds X in white or black. The all-new JayBird BlueBuds X2 are available in a much more exciting range of colors (but cost a bit more than the BlueBuds X). My experience of the JayBird headphones is that they are quite delicate and that you have to treat them with gentle, loving care. My experience with the Plantronics headphones is that they are very sturdy and rugged, more durable than the JayBird. I sleep in them, sleep on TOP of them, drop them, wear them in the rain, drop them in puddles – they just keep on going. So the Plantronics are the winners when it comes to durability. I find pairing to be seamless with both the JayBird headphones and the Plantronics. The Bluetooth pairing for both was quick and easy to set up, and there is almost instant pairing every time I switch them on. No complaints here. Plus, both the Jaybirds and the Plantronics almost never lose their Bluetooth connection. This one is a tie as they are exactly the same. These are very different on the Jaybird headphones and the Plantronics. The Jaybird headphones have soft foam ear tips that can (and do) fall off. Then, they can get lost, and you have to reorder them. On the other hand, the Plantronics headphones have silicone hard-bud earphones that are molded to fit into your ears. I much prefer this, because there is nothing to lose. On the other hand, if the silicone earphones don’t fit you, there is not much you can do about it. At least with JayBird, you can choose between small, medium and large. I call this a win for the Plantronics because there are no parts to lose. I did NOT expect to like the Plantronics headphones as much as I do, as I have been a big fan of JayBirds headphones (Jaybirds reviewed here) for a long time. I was very surprised to find that they are entirely comparable. At the end of the day, they are very similar headphones with very similar technology. The choice between them probably comes down to personal preference. It is certainly not true that Jaybird headphones are way better than Plantronics headphones and therefore should cost $40 more. 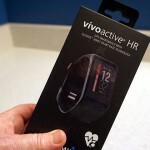 In fact, I have to admit that in terms of my personal preference for my active lifestyle, the more sporty Plantronics BackBeat FIT is the winner – and I can get them for a much lower price than the more expensive JayBird headphones. On the other hand, because JayBird has now moved on to the BlueBuds X2, you can often get the BlueBuds X for a bargain-basement price. I am putting in direct product links here, because the price of the BlueBuds X seems to change every day. Soon they will not be available at all. Related Post: Comparison of the Jaybird BlueBuds X with the brand new JayBird X2 – there’s been a lot of HYPE about the X2 being a “game- changer”, but this post will surprise you with the cold hard FACTS.